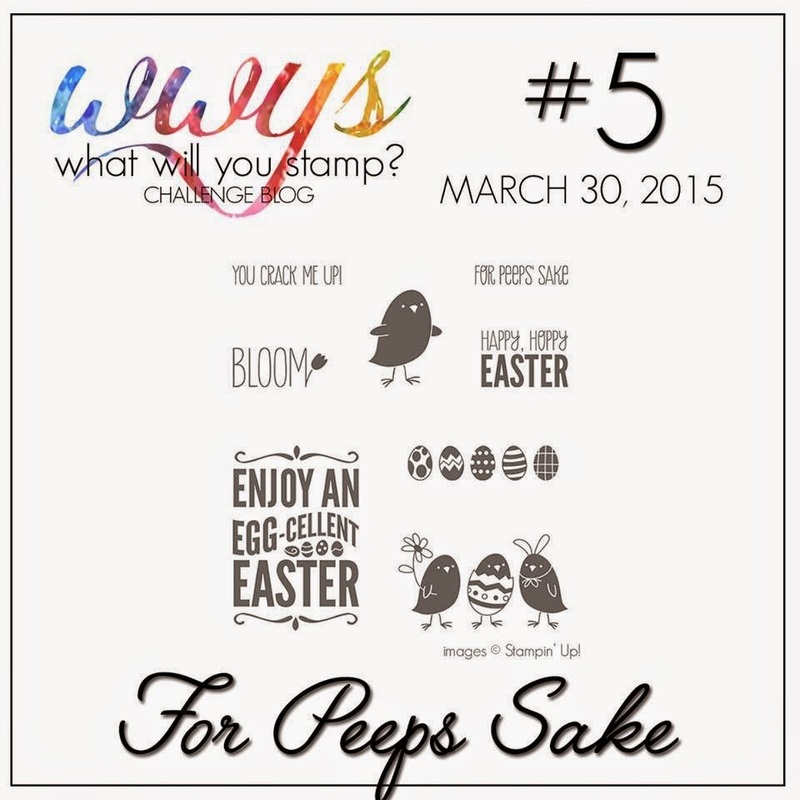 Welcome to What Will You Stamp #5! Can you believe it? We are on our fifth week of this challenge already-I'm excited! In case you don't know what WWYS is yet...It's an amazing new challenge blog that features a stamp set every week on Mondays! We all have one of those stamp sets lying around that we absolutely love but for some reason don't know what to do with, or, feel uninspired. That's where WWYS comes in! Check out the blog and see what our design team has created for the stamp set that is blocking your creative flow. Don't forget to check out the cards submitted by the challenge players as well because they are amazing! If you have great ideas about some of featured stamp sets please play along and submit your designs! We can't wait to see What Will You Stamp! 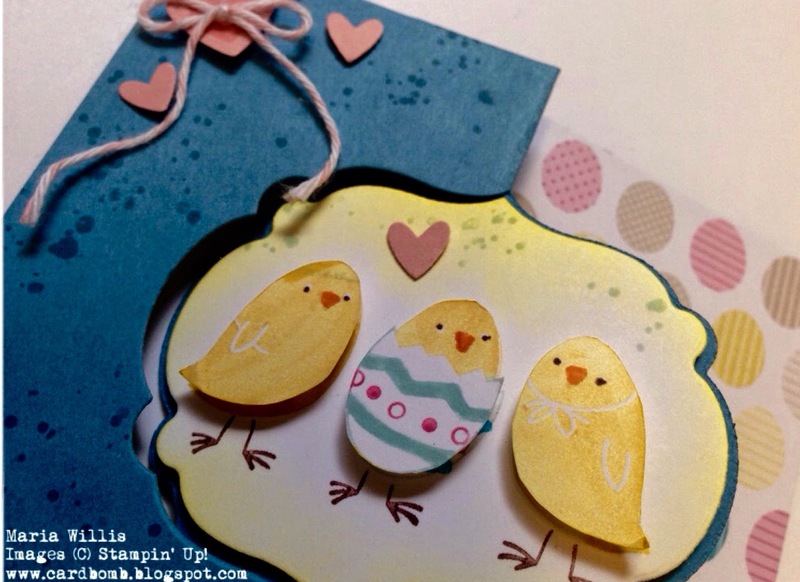 Easter is almost here so this week we have been challenged to use Stampin' Ups! 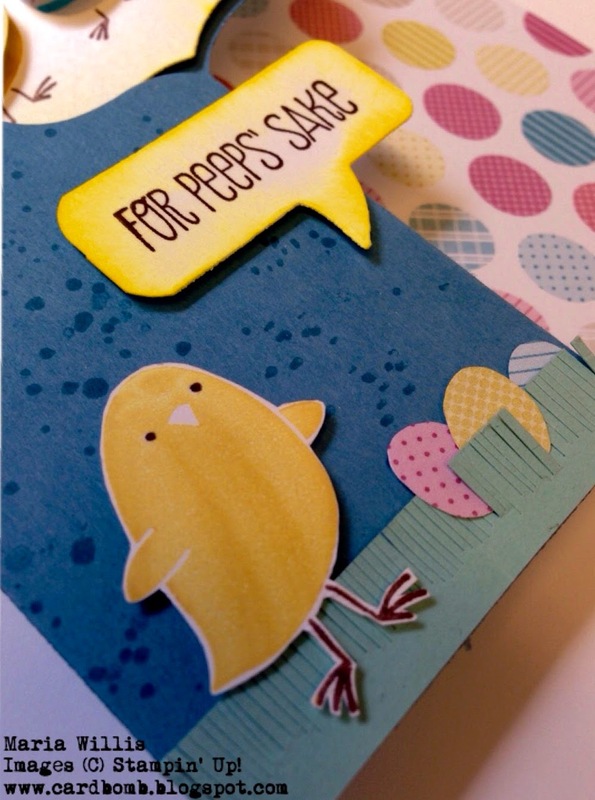 For Peeps Sake stamp set. Here's my card. It's a flip card. I love flip cards! I used Daffodil Delight to cut out the larger piece. 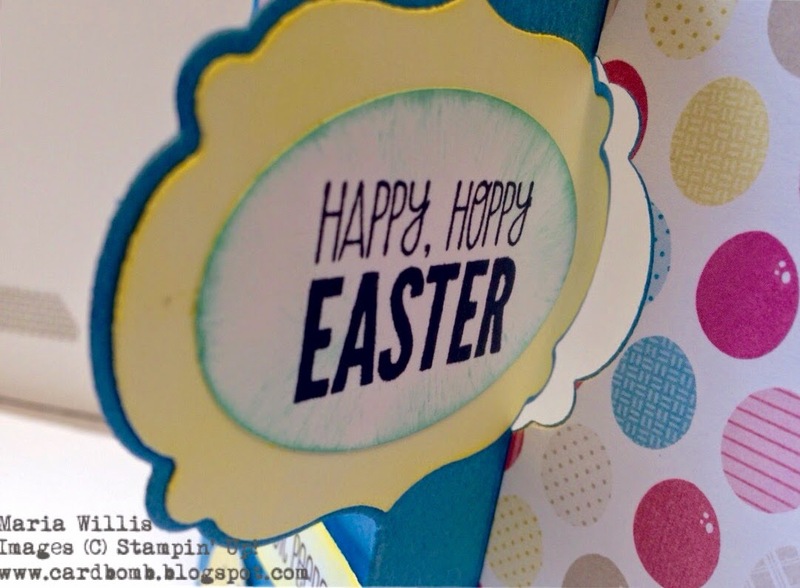 Then I used an oval punch to cut out the sentiment that was stamped on Whisper White and used a sponge dauber to add a little Pool Party to the edges. Here's a close up of the three little chicks on the front "flip." 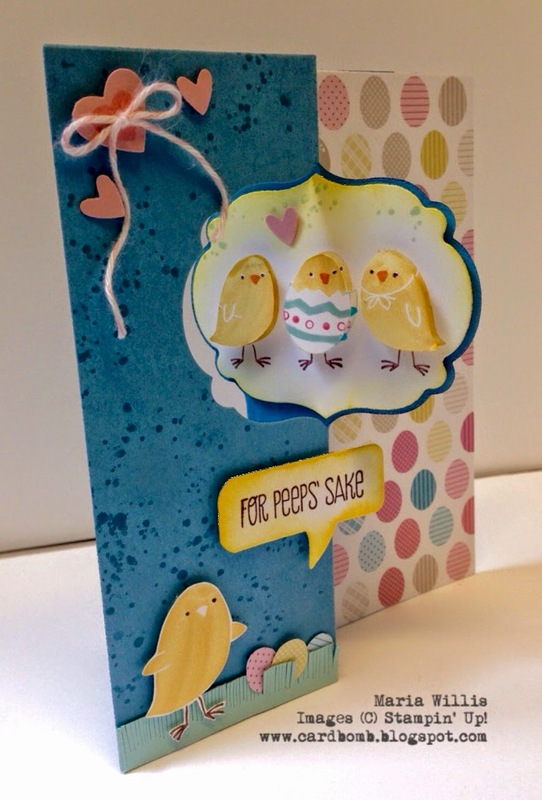 I used Crushed Curry on the chicks and Daffodil Delight to sponge the background. Then I used Gorgeous Grunge and Marina Mist to speckle the background a little more. I really had fun doing the bottom part of this card. I used framelits to make the word bubble that is sponged in Daffodil Delight. Then I used my paper snips to cut some Pool Party grass. I had extra DSP so I cut some of the cute little eggs out and stuck them in the grass. 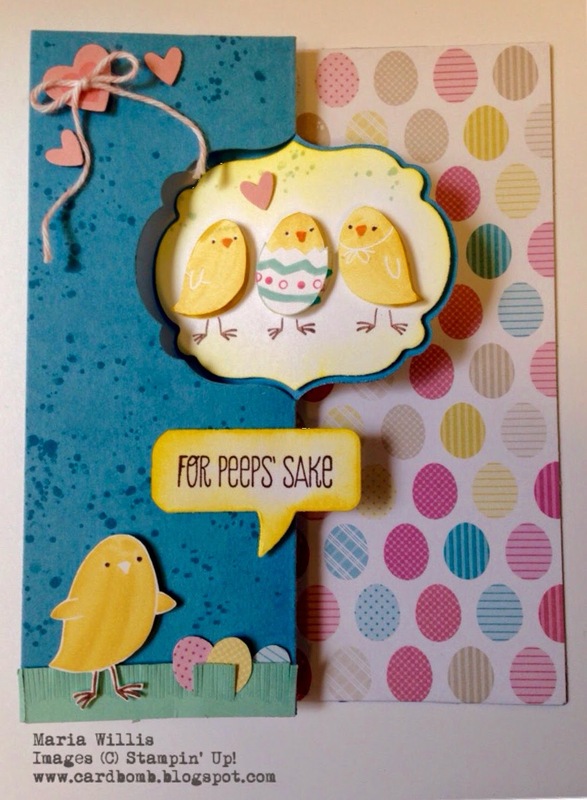 Here's the For Peeps Sake stamp set. I can't wait to see what the rest of the design team has come up with this week. If you have this set please join us! We would love to see your ideas too! I'm signing off for now but I hope you'll join us this week at What Will You Stamp? 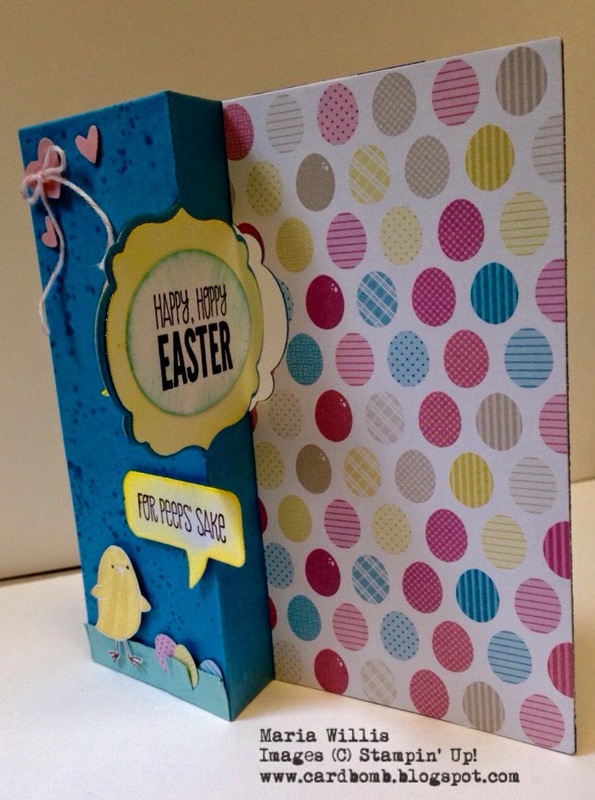 If you want to recreate this card, or, order any of the supplies I use please check out the supply list below. Please let me know if you have any questions! OMG! This is just adorable Maria! Love it! You totally rocked this one Maria!!! I love every little detail. Great job! Love the card Maria. I don't recognise the DSP and it's not in your supply list. Please could you let us know what it's called? Thanks Tracy! The DSP is a retired SU DSP called Birds of a Feather. I was lucky to get it on clearance before it was gone. I LOVE THIS CARD!!! and yes I'm yelling!!! Love the dimension and all the little details you added. Absolutely stunning!